Review by Edye Berkun Kamensky, Ed.M., M.A. I have heard many parents say it is only through the desperation of facing their daughter’s eating disorder that they began to see it was their family, and not just their daughter, who was in need of healing. Every family therapist knows this truth and strives to help the adults in each family come to realize it. 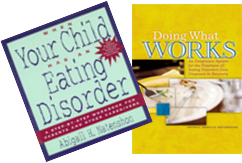 In her book, When Your Child Has an Eating Disorder, Abigail H. Natenshon helps to enlighten any parent who is willing to seriously read the contents and perform the more than 50 exercises contained therein. 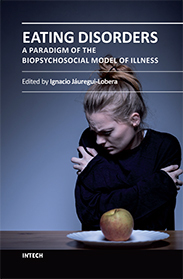 Subtitled, A Step-By-Step Workbook for Parents and Other Caregivers, this is an intelligent, informative and probing work that should be every parent’s companion through the assessment of their child and their family, and through treatment and recovery of an eating disorder. Natenshon’s 25 years of treating individuals with eating disorders is apparent throughout her book and she generously shares her wealth of knowledge and experience. She tells parents clearly that when they choose to commit themselves to the process of recovery, they are not only helping their child to reenter life, but they are also helping themselves to learn and grow emotionally. They will become a valuable part of the treatment team as they gain more confidence as parents. Wisely, Natenshon lets parents know that they are not just on the sidelines taking cues from their child or the professionals, but that they too have many of their own tasks to tackle. Natenshon divides the book into three sections. In section one, she asks parents to answer questions that enlarge the perspective that includes the parents’ own behaviors, beliefs and attitudes and the experiences they had growing up in their own families. Natenshon informs parents about eating disorders – what they are and are not. Early on, she introduces the idea that an eating disorder is about much more than food. She lists several areas of life in which severe distortions may exist – disorders of control, thinking, coping, identity, relationships, feelings, behavior, values and lifestyle. It is this type of thoroughness that characterizes the author’s approach, making it possible to see so many aspects of the eating disorder. In section two, Natenshon helps parents through what can be a labyrinth of overwhelming treatment options. Her conclusions here about what constitutes supportive behavior echo the feelings expressed by nearly every child struggling with an eating disorder – attend to your child’s emotional struggle, her personal well-being and your relationship with her. Do not talk about food. Natenshon gives instructions and examples of good listening skills. She prepares parents for resistance and, if necessary, commitment to a hospital. The final section of the book is dedicated to the recovery process. Natenshon’s view of recovery is summed up as "superb practice for dealing with life." She quotes Mark Twain, "Habit is habit…and not to be flung out the window by any man, but coaxed downstairs a step at a time." Here, the author demonstrates her respect for the unevenness of a recovery process. She addresses the questions of how, why and how long, and presents every stumbling block imaginable. No written information can fully prepare a parent for every possible eventuality, but Natenshon delicately balances reality and hope, and leaves parents feeling that recovery is possible. Abigail Natenshon’s book is more than a companion for parents and caregivers in the process of struggling with a child’s eating disorder. It is an invaluable friend to every therapist working with parents or caregivers. Natenshon’s voice is a soothing one of gentle authority that helps parents grow and nurture their children as they learn to face the pain of life again. *This article first appeared in PERSPECTIVE, the Renfrew Center Foundation's newsletter, Fall 2000 edition.